Gas bottles are an essential part of static caravan life but can sometimes be the forgotten piece of caravanning equipment – until you run out! In our latest giveaway we have a GasStop safety device up for grabs. GasStop will instantly shut off your gas supply in the event of a major leak or system failure, it also indicates when you are running low on gas. GasStop fits between your propane gas cylinder and your low pressure regulator (up to 50 mbar). It works in nearly all caravan gas setups and will immediately shut-off 100% of the gas supply in the event of a major leak. 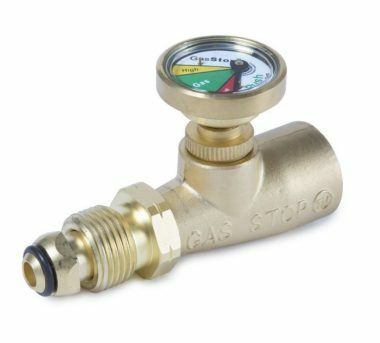 GasStop has to be reset by the user and will only allow gas to flow once the problem has been fixed. It also safeguards gas bottles that aren’t in use and out of sight – add further devices to those units and if the tap accidentally turns on GasStop will shut-off the supply until your system is safe. The device is easy to install and can also be used to test for minor leaks – allowing you to make sure your gas system is leak–free before use. Plus, its handy gauge lets you know when you’re running low on gas so you can plan your refill ahead of time. GasStop is highly engineered and comes with a five year manufacturer’s warranty. It’s widely used and sold in the Netherlands and has recently launched in the UK – now on sale from Bailey Caravan’s accessory store Prima Leisure. It can also be bought online from Amazon. The cost of the device is around £40. GasStop is a multipurpose device that will enhance the safety of your gas system and give you that extra peace of mind whilst enjoying the great outdoors. For more information (including all FAQ’s) head over to their website here. Poll: How old is your static caravan, lodge or chalet? Loads of good tips from Leisuredays. Very informative site, trust leisuredays completely, have had Caravan insurance with your company for over 25 years! Enjoy looking for information and being kept informed! Pleased to receive the occasional informative emails..always stress free and useful. I fitted an automatic drain down unit as recommended by your company and have found it to be wonderful. It is saving me £70 a year to protect my caravan.